The recently renovated museum provides “constant flow” of research participants for developmental scientists from the University of Ottawa. As you enter ZOOOM, the “children’s innovation zone” at the Canada Science and Technology Museum in Ottawa, you walk into a circular room teeming with bright orange and green play structures, and surrounded by walls splashed with color and information. Nestled in the corner of this space is a set of comparably minimalistic rooms. Here, science is not just on display, it’s made. The University of Ottawa partnered with the museum to add this exhibit, a “living lab,” as part of the CSTM’s $80-million refurbishment. It opened with the museum relaunch last year on November 17. 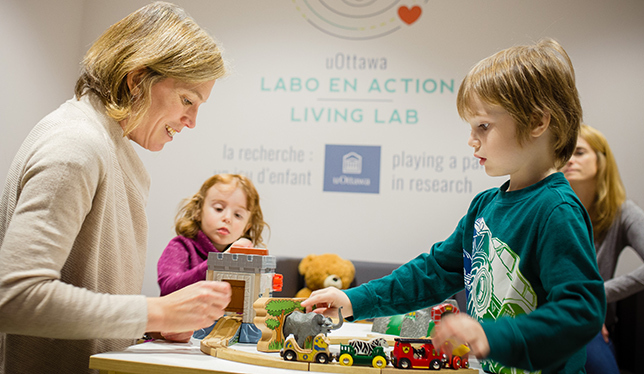 Lab co-directors Cristina Atance, Tania Zamuner and Chris Fennell, all professors at U of Ottawa, explain that living labs are innovative research spaces that are accessible to the public and rely on public participation. At this particular lab, the subject is developmental science, specifically development and learning in infants and children, and the factors that impact these processes – which makes its location in an interactive children’s exhibit at a national museum ideal. While curious parents and kids wander about exploring the space, they’re invited by researchers to participate in on-site studies on topics like critical thinking and bilingual development. “They’re primed when they’re out in this area,” says Dr. Zamuner, an assistant professor in the department of linguistics. “They’re walking through the science museum and just flow right in.” Dr. Atance, an associate professor of psychology and director of graduate training in experimental psychology at the university, adds that parents are often surprised by what their children say or do in these studies, and learn something about their kids in the process. Children explore the living lab with Dr. Atance. Studies last five to 15 minutes and often use eye-tracking software to measure a child’s response time following a question. In one of Dr. Atance’s studies, a participant is given a few tokens that they can exchange for either raisins or Smarties. Raisins are offered first and Smarties (generally assumed to be the preferred treat) are only offered after the child has decided how many tokens to exchange for the raisins. The goal is to determine around what age children start develop the critical thinking required to save more tokens for the better treat. Partnering with the museum to make space for this innovative lab doesn’t just benefit the visitors, Dr. Atance explains, it assists the researchers as well. In just over a month, the lab attracted 171 participants in studies – the researchers estimate it would take a year in a conventional lab setting to test that many participants. Here at the museum, a space that already caters to children, there is “a constant flow,” Dr. Atance says.